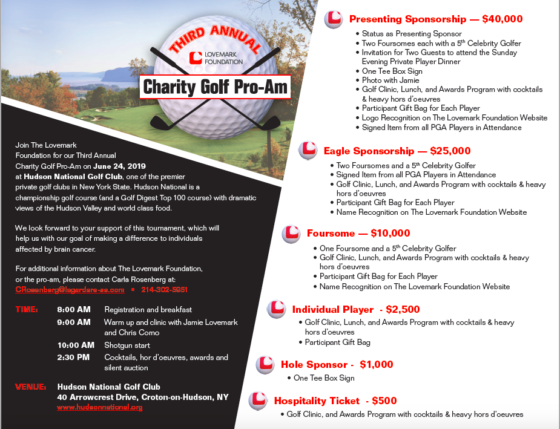 Join The Lovemark Foundation for our third annual charity golf pro-am on June 24, 2019 at Hudson National Golf Club, one of the premier private golf clubs in New York State. Hudson National is a championship golf course (and a Golf Digest Top 100 course) with dramatic views of the Hudson Valley and world class food. Both foursomes and individual player sponsorships are available. All packages include lunch, cocktails, and reception. We look forward to your support of this tournament, which will help us with our goal of making a difference in the lives of individuals affected by brain cancer. To register for the 2019 Charity Pro-Am, please click HERE. © 2019 The Lovemark Foundation. All rights reserved.